The AMR crew was at the recent SME Arizona Conference at the Starr Pass Resort outside Tucson and we interviewed a number of the speakers and prominent attendees about current developments in Arizona mining. We also sat down with the legendary David Lowell to talk about his new book, "Intrepid Explorer: The Autobiography of the World's Best Mine Finder." On January 29, join Professor Lindy Elkins-Tanton, director of ASU's School of Earth and Space Exploration, for the inaugural lecture in the SESE New Discoveries series. Dr. Elkins-Tanton will present a lecture on "Building Earth-like planets: From gas and dust to ocean worlds." Lectures will be given in the Marston Exploration Theater. They are free and open to the public. Over 500 attended the Society for Mining, Metallurgy, & Exploration's (SME) 2014 Arizona Conference earlier this month at the Starr Pass Resort in Tucson. So many showed up that the organizers were scrambling to set up enough tables to accommodate everyone at lunch. The day-long technical program on Monday, Dec. 8 had multiple concurrent technical sessions Mining Technolgy, Regulations in Arizona, Mineral Processing, Geology, Mexico, Blasting, and New Projects. The big turnout came as a bit of a surprise, given the drop in commodity prices and uncertainty over a number of major projects. This suggests a quiet optimism in the industry and that folks are in for the long term. 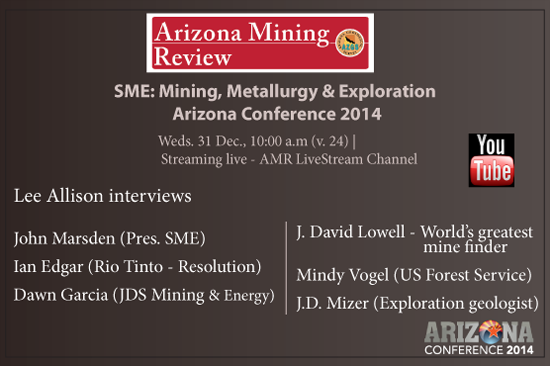 We interviewed half a dozen of the presenters for a special year-end episode of our online video magazine, Arizona Mining Review, which will be broadcast on Dec. 30, then posted to YouTube. The Fall Meeting of the American Geophysical Union drew nearly 25,000 attendees to San Francisco, which made it an major forum for AZGS projects. The weekend prior to the regular meeting, we hosted the Steering Committee of the Belmont Forum e-Infrastructure project for a 2-day workshop on the strategic plan and recommendations to science funding agencies of 13 countries and the European Union. We had 25+ participants from a dozen countries join us in one of the converted buildings from the old Ft. Mason on the San Francisco waterfront [top right]. Members of the U.S. delegation to the Belmont Forum joined us for lunch on Monday for a briefing and to review plans for preparing the final report. AZGS staffed two booths in the Exhibit Hall as part of outreach elements for the Belmont Forum and EarthCube projects. We also organized and hosted town hall meetings for those projects [right, EarthCube town hall]. 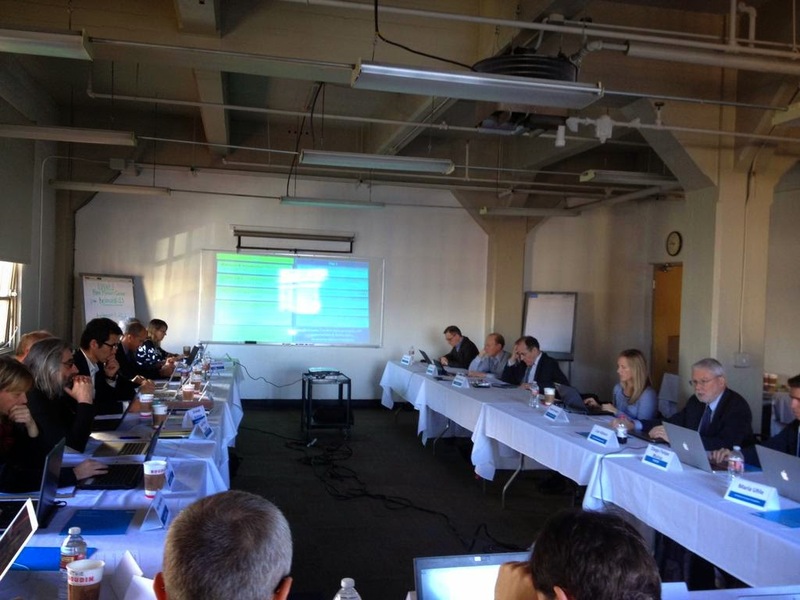 The newly-elected EarthCube Demonstration Governance Leadership Council met for the first time, under the auspices of the NSF-funded AZGS project. AZGS staff were lead authors on 3 technical posters - EarthCube, National Geothermal Data System, USGIN open data solutions - one talk on Belmont Forum, and co-authors on multiple other presentations, including OneGeology, and EarthCube building blocks. I also had the honor of serving on a Union Session "Great Debate on Open Data" with three others. It was an experimental format that seemed to go over well and the organizers expect to do more sessions like this next year. The International Geological Sample Numbering system (IGSN) celebrated its 10th anniversary at the meeting, with a board meeting and town hall. AZGS is one of the founding members of the formal non-profit corporation and is authorized to issue numbering systems to U.S. entities. With all those folks at the meeting, we had nearly non-stop conversations with colleagues and partners about ongoing and potentially new projects. The Lowell Program in Economic Geology appreciates the financial support of Newmont Mining Company for their short courses in recent years. The course will be based in Tucson, Arizona, with easy access to first-class geological exposures, and (normally) pleasant spring weather conditions. There will be 9 days of engagement, with 1.5 days of classroom presentations and 7.5 days in the field. The course will focus not only on individual geologic structures, but systems of structures. Field examples and exposures will highlight both extensional and contractional systems, and in each case examples range from shallow to deep expressions. Some of the field exercises are held in mining districts. Topics covered in the short course include fault and shear zone analysis, metamorphic core complexes and associated faults, breccia pipes and related igneous systems, fold analysis, folds in thrust duplexes, jointing, and evaluating complex geologic map relationships. Some of the field work will engage participants in evaluating outcrop relationships and deciding (1) what needs to be mapped, measured, recorded, sketched, and photographed; (2) how best to go about it; and (3) how to interpret the geological significance of key relationships. Some of the fieldwork will engage participants in tracking and mapping geological contacts (such as faults, shear zones, igneous contacts). The overall objective is to stimulate greater efficiencies and competencies in deciphering challenging structural geological relationships and histories. Knowledge gained will be applicable to most aspects of empirical geological inquiry, no matter whether the data sources are outcrops, geologic maps, cross sections, thin sections, seismic reflection profiles, pit slopes, or drill hole data. Participants should plan to arrive in Tucson no later than Friday evening 13 March and depart from Tucson no earlier than the morning of Monday, 23 March 2015. The Marriot Hotel, which borders the University of Arizona campus, will be the base of operations. The early registration cost of the short course for non-university participants is US$3,200, which includes ground transportation, all lunches in the field, and a final dinner. Breakfasts and all other dinners are the responsibility of participants. Industry participants also will need to provide their own transportation to and from Tucson as well as their accommodations. Please respond via e-mail to brambila@email.arizona.edu for reservations, registration, and questions. Register soon! Please find attached to this letter all registration materials (registration and foreign visitor statement forms in English and in Spanish, as well as the documentation required for foreign nationals (non-US citizens) so that you can forward this information to your co-workers and friends). Visit the webpage: http://lpeg.geo.arizona.edu/ to learn more about the program and short courses.